Last Saturday, I ran the inaugural Livermore Half Marathon – the first of what will be many more for this event, I’m sure. The event had two distances: the marque Half Marathon and a Family Fun 2.5K run/walk (which wasn’t timed.) I hadn’t been to Livermore in a while and forgot how picturesque it was…quaint downtown, suburban communities, ranches, vineyards, great parks system: the perfect venue for a race. I will say, for a smaller community, they pulled out the stops for this event, which will no doubt draw people back next year – I know I will be back for sure. Weather. The weather forecast was 70-80% chance of rain/showers all day – particularly in the morning. At start time, it was partly cloudy, about 55 degrees, with an 11-MPH wind. It looked like it could rain, but the clouds were pretty high, so I thought it would hold off for a while. At the finish, it hadn’t started raining and was just a tad warmer. Bottom line, weather was great for a race! Course. 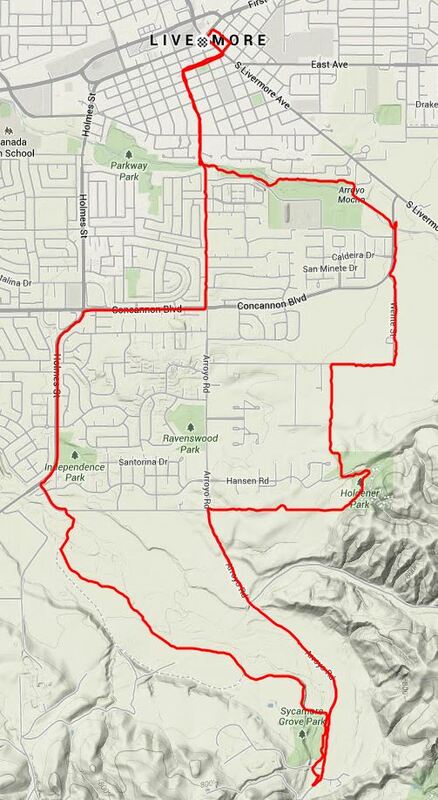 The 100% paved course was a counter-clockwise loop that started and finished in the heart of downtown Livermore. It left city center, headed south through town and the suburbs, then at ~mile 3.3 entered the park/ranch/vineyard portion (which actually made up ~70% of the course.) After that, runners returned to the downtown area for the finish. From an elevation standpoint, overall, it was a pretty flat course. Miles one through seven were light rollers, with the only hill coming between miles 7.25 and 8.8 (for about 160′ in climb) – again, not to bad…nice and gradual. After that, it was downhill all the way to the finish line. Management/Support. Course management, support, and volunteers were awesome! The course was clearly marked and had signage and cones at the turns where traffic could become a problem (the local roads were not completely closed for the event.) The aid stations were spaced great and staffed by plenty of volunteers. The neighborhoods came out in force as well, cheering runners on as we passed homes and businesses. Again, from my observation, Livermore really embraced the event. The organizers also had photos taken along the course (courtesy of Project Sport and Gameface Media) and offered them free to runners – which was a very nice touch. A few of the free photos are shown below – they are pretty nice and adding the event logo was a nice touch as well. Post-Race. The post race area was well-planned – all in one: the finish line fed right into the food/SWAG/awards area. Livermore, being home to several vineyards, meant they had numerous booths for wine tasting. As each runner crossed the finish line, they received a medal and an event wine glass. The wine glass also was used for post-race hydration – they had huge water dispensers at the finish line, ensuring a “green” race. They didn’t have the standard food fare (bananas, bagels, etc. ), instead, a local donut shop gave out donuts to finishers – which could be chased by Muscle Milk, wine, water, or lemonade from another vendor/sponsor. Medal/Shirt. Each finisher received a medal and a wine glass. Shirts were picked up with bib packets. The wine glass didn’t have the event logo, which would have been cool. Shirt and medal are pictured below. A few weeks ago, I flatted while on a bike ride. After replacing the tube, I mounted the bike, started to head out, lost my balance, couldn’t unclip fast enough, and tipped over falling on my left side. At the time, I was fine – except for my pride (a guy was running by at the time.) Later that day, my hip started to hurt and I’d been nursing it ever since. At race time, it was pretty good but, as you’ll read below, it wasn’t perfect. On a Saturday morning, Livermore is about a thirty minute drive from my house. So, I didn’t have to get up too early! That said, I did…it’s just a race-day routine. I got to the event location early enough to park in a covered garage, just in case it did, in fact, pour rain during the race. I thought I’d prefer a covered location post-race rather than an open parking lot. I got there, parked, and walked to the start area to scope things out. I hit the porta-potty (FIRST! ), got a sense of the start line area and corral arrangement, and then went back to the car to get ready. They had a bag check area, but I was close enough that I didn’t need to use it. I chilled in the car for a bit, got the rest of my kit on, and then moseyed back to the start to get lined up. The race started on time – which was nice, since it didn’t start until 0800…I much prefer an earlier start. I lined up about 20 yards from the line – moving up about three times after looking at my fellow runners in the various areas. I really didn’t want to weave in and out of traffic and have learned over time that most people do not pay attention to the instructions on lining up according to pace. After I settled on a spot, the pacers came into the start corral. I located the 1:50 pacer and lined up near him, decided to stick with or just ahead of him. The countdown came and we were off. Overall, I am very happy with my race – 42 seconds off goal ain’t bad. I always tell myself that not all races are or should be “A” races; even so, I usually train and run like they are. In the end, and all things considered, I finished without much hip issue (I’ve had a good week of training,) with a great finish time, and surprisingly good placing in each category. From an event perspective, this was a great one: small event, scenic and fast course, great pre- and post-race areas. 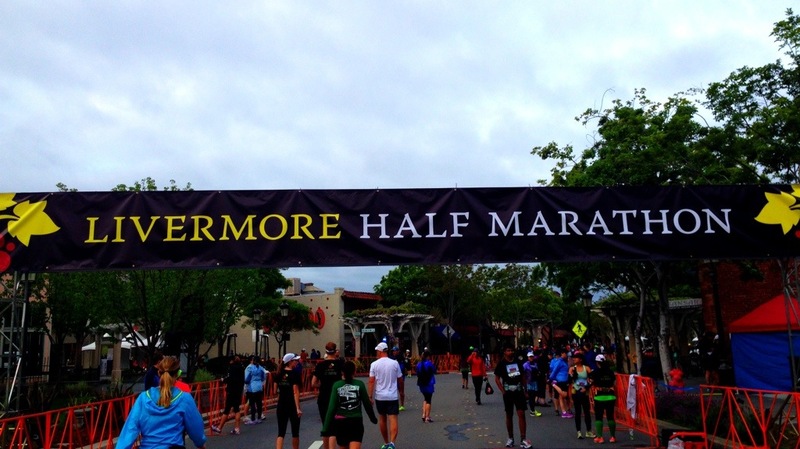 Given schedule, the Livermore Half will probably become an annual race for me. Fueling. Pre-race, carb loading: I did my normal routine: 36 hours of >80% carbs and +500 calories above my normal day. Race-day fueling: Bagel with 2T peanut butter at -3 hours, a GU at -45 min, a GU & salt tab at -15 minutes, and GUs (2) and an additional salt tab along the way. I drank 20 oz. of GU Brew electrolyte during the run, supplemented by a few cups of water from aid stations. Equipment/Kit [head to toe]: The North Face Better Than Naked hat, The North Face Better Than Naked jacket (actually tied around my waist instead of wearing since it wasn’t raining), Brooks tech shirt from RnR San Jose, Armpocket armband, Picky Bars #TeamGreen wrist band, Road ID (Slim), Amphipod handheld, ASCIS 55 Shorts, CEP Compression Sleeves, Road Runner Sports Dryroad socks, Altra 3-Sum shoes. Here are some photos I took or downloaded. As usual, I took no photos on the run portion…I’m too focused to stop and take ’em! Great day for a run! All smiles at the finish! Bottom line: Excellent event, great race for me – I’ll definitely run it again next year…with a course PR as a goal! If you are in the SF Bay Area next March, I highly recommend running this one. Post-race meal: Did a quick clean up post race and drove to meet my wife and mother-in-law for a late breakfast: PANCAKES!! !